The athletic training program (MS.AT) at Chapman University has voluntarily withdrawn their CAATE accreditation and is no longer admitting students. The date of voluntary withdrawal of accreditation coincides with the graduation of the last cohort in August 2019. The master of science in athletic training is an accredited professional graduate program by the Commission on Accreditation of Athletic Training Education (CAATE). The program prepares students for a career as a certified athletic trainer. Athletic trainers (ATs) are health care professionals who collaborate with physicians to optimize activity and participation of patients and clients. The services provided by ATs comprise prevention, diagnosis and intervention of emergency, acute and chronic medical conditions involving impairment, functional limitations and disabilities. Athletic training is recognized by the American Medical Association as a healthcare profession. The master of science in athletic training (MS.AT) is a full-time, cohort-model program. As a cohort-model program, admission into the MS.AT program is highly competitive and limited. This full-time, intensive program is a rich combination of didactic, hands-on clinical laboratories, and clinical fieldwork providing carefully guided clinical experiences every semester. Clinical fieldwork placements include a variety of colleges, universities, high schools and physician offices. The MS in Athletic Training program is an accredited graduate professional program by the Commission on Accreditation of Athletic Training Education (CAATE). Successful graduates of the Athletic Training program are eligible to take the national certification examination offered by the Board of Certification, Inc. The next review of the AT program will occur in the 2018-19 academic year. The AT program has a 100% pass rate on the national BOC certification examination over the last 5-years and first-time pass rate of 94.74% is well above the national average of 82%. In the most recent data available on the certification exam, Chapman graduates averaged nearly 30 points higher than the national average and scored higher than the national average in all 5 domains of Athletic Training. Chapman University's M.S. in Athletic Training program uses the Athletic Training Centralized Application System (ATCAS). Applications may be obtained from ATCAS at http://caate.net/apply-now/ and will be available the year prior to your intended matriculation, beginning each year in July. The M.S. in Athletic Training program has two routes for admission, with each route requiring the prospective student to complete the required course prerequisites. An earned B.A. or B.S. degree from a regionally accredited college or university. Cumulative GPA of 3.000 or higher. Prerequisite (all required courses) GPA of 3.000 or higher (on a 4.000 scale) with no course grade below a "C". Health Science undergraduate major at Chapman University. All general education courses completed prior to matriculation in the graduate program. All Health Science major courses completed with the exception of emphasis area courses (20 credits of the M.S. in Athletic Training program will count towards the undergraduate degree requirements and will be used for the area of emphasis within the major). Minimum of 100 completed undergraduate credits prior to matriculation in the graduate program. Prerequisite (all required courses) GPA of 3.000 or higher (on a 4.000 scale with no course grade below a "C"). Satisfactory completion of 120 hours of observation supervised by certified athletic trainers. Three letters of recommendation which describe academic and clinical abilities (one must be from a supervising certified athletic trainer and another must be from an academic advisor or instructor). (International Students Only) – Applicants who have completed their undergraduate degree outside of the United States are required to achieve an acceptable score on the Test of English as a Foreign Language (TOEFL), minimum 550 (paper-based) or 80 (internet-based). Prerequisite course syllabi are required at the time of application. If a combined Anatomy/Physiology course is taken, two–semester or three–quarter courses are required. Prerequisite courses may be repeated only once; the second grade will then be used to calculate GPA. Pass/Credit grades for prerequisite courses will be converted to a "C" if letter grading options are not available. Courses which have received advanced placement credit (AP or CLEP) may fulfill prerequisite requirements. The credit hours and grade points will not be computed in the GPA calculation. CPR certification required. Emergency cardiac care or CPR/AED for the professional rescuer (note: online CPR courses and Lay Responder Certification are not accepted). Students who are offered admission are required to financially commit and enrollment deposit with the Office of Graduate Admission. Generally, the deposit must be received within two weeks of notification of admission. Students must satisfactorily complete all remaining prerequisite course requirements in accordance with the admission requirements before beginning M.S. in Athletic Training coursework. Accepted students are required to meet technical standards and specific health requirements (e.g., vaccinations). Information on these standards and requirements, as well as such information as program costs, financial aid and BOC pass rates may be found on the program's website. Personal interview: After initial assessment and screening of applications, a portion of selected applicants will be required to be available for an online interview with the faculty admissions committee. Persons who have been dismissed from another athletic training program are not eligible for consideration for admission to Chapman University. Applicants who decline or are denied admission may reapply in any subsequent year. Admission requirements are subject to change, and admission in one year does not guarantee admission in any subsequent year. Persons who cannot pass an FBI/Department of Justice Background Check are not eligible for clinical education rotations and are not admissible to the program. Chapman University considers all applicants without regard to race, religion, color, national origin, ancestry, gender, marital status, sexual orientation, special needs, veteran status or any other characteristic protected by applicable state or federal civil rights laws. Some information requested in the application is requested for federal or accreditation reporting and will not be used in a discriminatory manner. Is there a recommended undergraduate major to enter the Master of Science in Athletic Training (MS.AT) at Chapman University? There is no specific required major at the undergraduate level as long as you have met the prerequisite course requirements. The most common undergraduate majors are Health Science, Kinesiology, or Exercise Science, but there is no preferred undergraduate major. What are the prerequisites to the program? I am graduating from an accredited undergraduate athletic training program, am I eligible to enter the MS.AT program? No. The Athletic Training program at Chapman is an entry-level program where graduates are eligible to take the national, Board of Certification (BOC), certification examination. If you graduated from an accredited undergraduate program than you have already met the entry-level requirements to take the certification examination. Is the Athletic Training program at Chapman an accredited program? Yes. 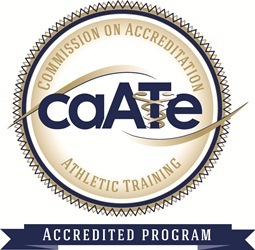 We are accredited by the Commission on Accreditation of Athletic Training Education (CAATE). Our goal is to admit a maximum of 20 highly-qualified students per year. Where can I complete the application? The application is available at the Athletic Training Centralized Application Service (ATCAS) website at https://portal.atcas.org. This application is very thorough and includes your personal information, academic history, supporting information, and program specific documents and questions. Through the ATCAS website, applicants can save their application as they complete each section and submit when ready. Official transcripts of all colleges/universities attended are sent to ATCAS directly and ATCAS verifies that the official transcript and the courses noted by the applicant within their application are consistent. Instructions for where to send your transcripts are given within the ATCAS application. Letters of recommendation will be uploaded by the recommender directly to ATCAS. As part of your application, you will complete the contact info for each person you wish to write a letter on your behalf (one must be from a certified athletic trainer that has observed your clinical skills and another must be from a professor/teacher who can describe your academic abilities). You should not receive letters of recommendation directly from your designated recommenders. We have a rolling deadline of admissions with the first review of applicants for those that have their application submitted, and official transcripts received by ATCAS, by December 1st. Because of administrative delays in ordering/sending official transcripts from each university/college attended, it is recommended to request official transcripts to be sent to ATCAS by mid-November. All applicants that apply, and have their official transcripts received, to ATCAS by December 1st, will receive priority in review and evaluation for admission. How many clinical hours are required? Is there a specific form needed to verify hours? We require a minimum of 120 hours working under the supervision of a certified athletic trainer. There is no specific form necessary for hour verification, typically a signed letter, or spreadsheet, from your supervising athletic trainer(s) is sufficient. This document will be uploaded to the ATCAS application. Do I have to take the GRE? What is the minimum score required? Yes, all applicants must take the GRE. GRE official test score reports are sent to Chapman University and the reporting of your score is a component of your ATCAS application. At this time, we do not have a minimum score required for the verbal and quantitative sections of the GRE. The ATCAS ETS Code for our program is 1772, please use this code so that your scores are attached to your ATCAS application. What if my prerequisite courses are not completed by the time I submit my application? All prerequisite courses must be completed by the start of the program at Chapman University. Many applicants have 1-2 prerequisite courses still in progress, or plan to complete in the spring semester, when the application is submitted to ATCAS. What is the starting date of the program? The program begins during Summer Session V of the academic calendar. For 2018, mandatory orientation will begin on June 23rd with classes beginning on June 25th. When will I be notified if I am officially admitted? Interviews will take place in mid-January with notifications by early February. Should I plan on visiting for an interview? All interviews are conducted via computer through an online video conference call software similar to Skype. Any prospective student is open to visit the campus but interviews will be conducted online to ensure consistency amongst all applicants. Are scholarships available for admitted students? How do I apply? Yes, scholarships are available. In previous years, scholarships have been offered between $2,000 and $9,000 for highly qualified students. The process for applying for a scholarship is built into the ATCAS application to our program. Students enrolled in Chapman University’s Athletic Training Program will provide patient care under the supervision of preceptors. Chapman University works with approximately 30 clinical sites and 40 preceptors to provide students with a variety of clinical experiences that prepare students to become highly qualified healthcare professionals. We prioritize high quality and variety of experiences, while allowing for customization to individual student needs and career goals.